It is hoped that eventually this page will tell the story of the woods and surrounding area. There is a lot to tell from burial mounds to the coming of the railway and much more. 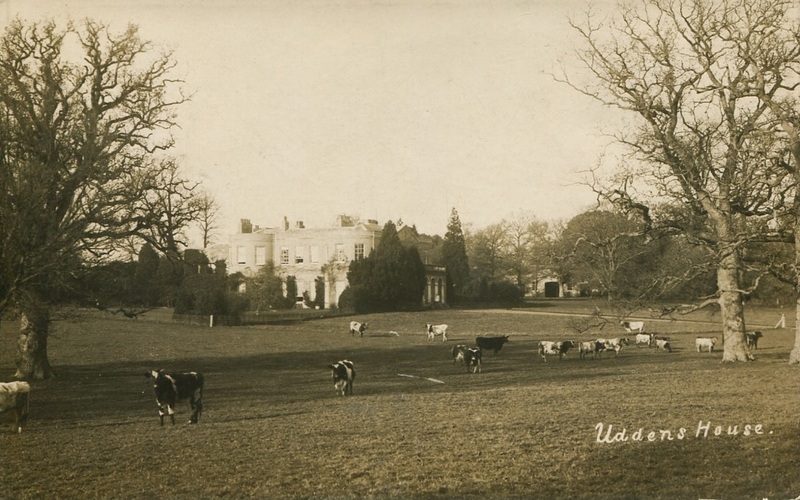 To kick things off we start off with a few picture of Uddens House a long since demolished stately home whose Beech tree and Rhododendron lined drive way is still very much a part of the woods. We really need help with this page though so if you have any picture we can carefully scan or stories and legends to tell please get in touch. A couple of years before my mother died I got her to talk, whilst I typed and she ‘took’ me through a room by room tour of the House in it’s grandeur. ​ Apart from a few tweeks, it is written exactly as she told it to me and it was obvious she was ‘seeing’ it all through her 14 year old eyes in 1934. 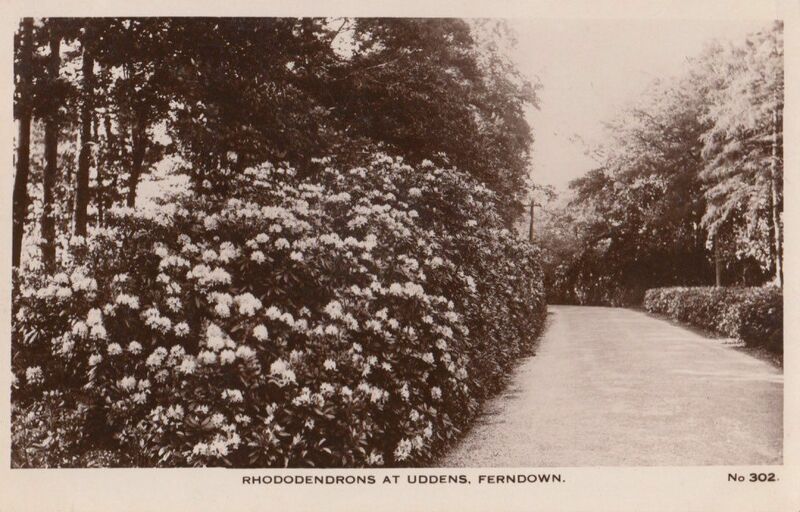 The Old Thatch was originally built as the Gate House for Uddens House and Uddens Drive was planted with ornamental rhododendrons as the driveway to it. 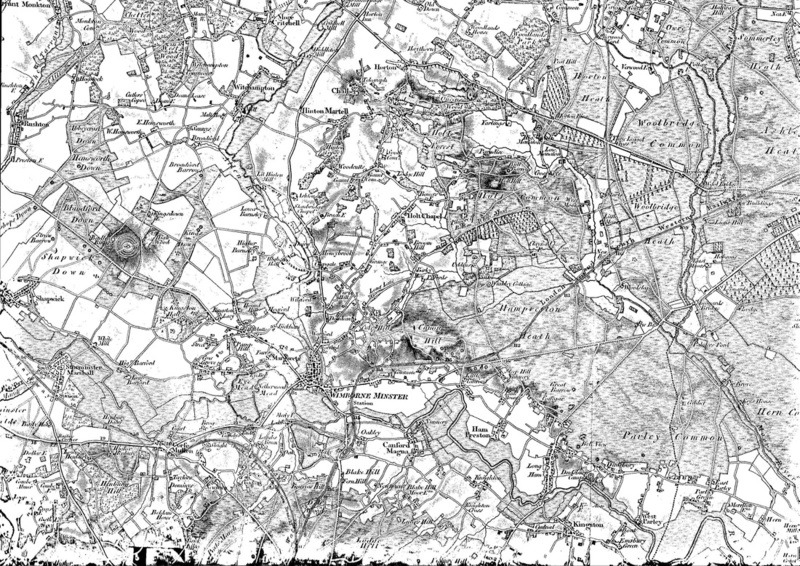 Granny Hillier lived there when I was a child in the early 1920’s. She took in children of the village, especially those who had children out of wedlock. She was paid for this. I think her husband was an estate worker for the House. 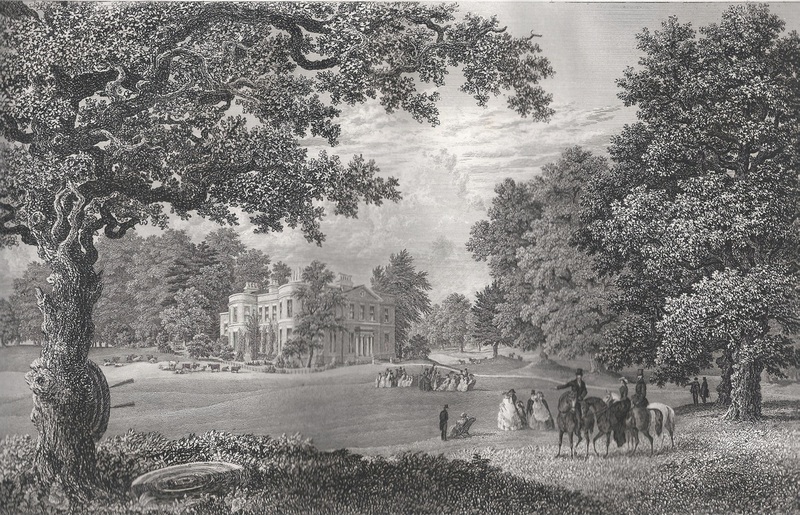 Uddens Drive serviced the House, but Sir Richard Greathed who owned Uddens House had an offshoot of the railway installed to allow his guests to come down from London. Also when he did the Season with his three daughters in London he had produce sent up daily from his gardens and also the laundry was sent up via rail. One of his daughters was called Elizabeth, who married a Captain Oldfield. Miss Greathed was the middle daughter and I don’t remember her name. She never married. Mrs Hanbury Tracey was the youngest daughter and lived at Oliver’s House in Colehill, where I was born because my father was the farm manager of Uddens House. Uddens Drive had Lodge House called The Wigwam which was situated where Wayside Stables is now. As the name suggests, this was a wigwam shaped property in the same design as the original Old Thatch. Ultimately it burnt down and was replaced by a small modern bungalow. My earliest recollection is of Mr and Mrs Bryant living in it. Mr Bryant was the Head Gardener for the Estate and Mrs Bryant helped out as Parlour Maid when parties were being held. They had two sons, Reg and Harold. My mother Nellie Carrington worked as Cook/Housekeeper at Uddens House in the 1910’s. She was widowed with one child and she met my father George Smith in his role delivering milk to the household. 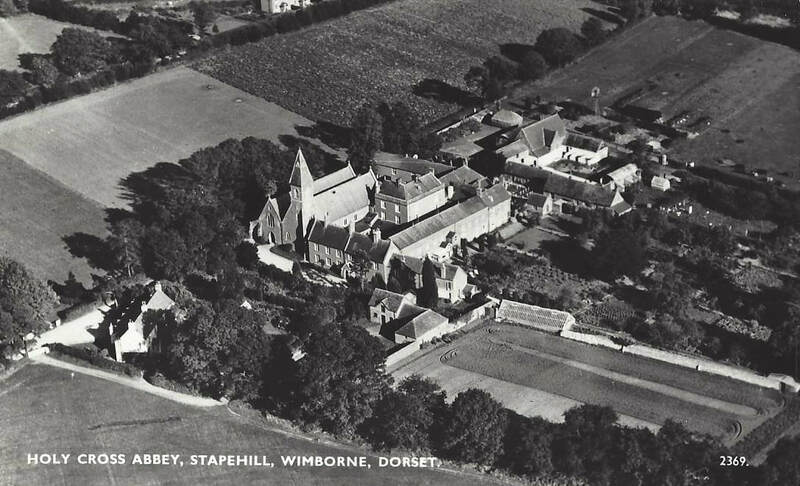 They ultimately married at Stapehill Abbey in 1919. I was born one year later and named Alice after a great aunt, and Elizabeth after Mrs Oldfield when she became my godmother. I have no recollection of going to the house with my mother until I was 14 (in 1934) and left school to work there as Nursery Maid. By this time Mrs Oldfield had let Uddens House and built Bedborough House where she lived with her old nurse who was just known as Didda. 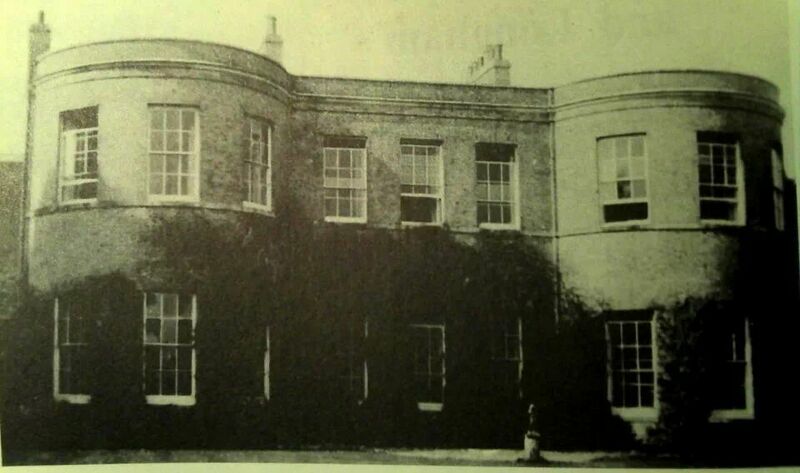 I was Nursemaid at Uddens House to Colonel D’Pentheny O’Kelly and family who rented it furnished from the Oldfield’s. They had Moira, Noel, Peter, Tommy, Sadie and baby Julie who I was employed to nurse. The House was entered via a gravel driveway which swept between two fields in a curve. Tennis courts were on the right hand side. At the front door there were mounting stones to enable them to climb onto horses. A huge coconut mat which was so heavy the head gardener used to lift it to bang the dirt out was outside the front door. As you entered the doors there was a large Hall with two huge tables made from estate wood. Big stone flooring with coconut matting was in this area in a square. A Study went off on the right and the Drawing Room on the left, which faced towards the garden and had a beautiful Adam fireplace. As you exited to the left there was the Morning Room which faced to the front across the lawns. Next to that was the Dining Room which also faced the lawns. The lawns were cut by a pony with pads on its feet so as not to spoil the grass. There were two doors to the Dining Room, one from the front Hall and the other from the Pantry which was the Butler’s domain. There was a door to the side which was seldom used. The Butler’s Pantry was at the end of the passageway which led from the Kitchen. The Kitchen had large kitchen ranges which were fuelled from wood off the estate and had a wooden seat which went up the back and over the top where the Cook used to sit next to the stove. In a corner was a big stone sink and in the opposite corner was a large Pantry but out of the back door you entered the Scullery which was very scary as it was full of rats. You stood on wooden slats and had wooden sinks which was where the Scullery Maid had to wash all the plates and dirty pots and pans. That led out into the Yard where coal sheds were. Back in the kitchen there was a Boiler Room off and a big stove like kids used to have at school and which made all the water hot. It was fed by coke. There were dressers like Welsh dressers in there. Out of there and opposite was the Boot Hole where the boots and knives were polished. On the left hand side was a big room which the beaters and people used when the Estate held shoots and had stone steps up and there was a flat over the top. At the back door to the right was a Courtyard and a Well. In the corner was the Game Larder and down three very worn steps from outside, coming back in on the right hand side was a huge place for all the wood and an Engine House which held whatever powered the light. This was looked after by the Chauffer. By the steps was the Back Stairs leading upstairs and there was a huge vat where they made their own cider. Leaving the Pantry on the right it was big enough for a horse and cart to go through the stone passages. Going back to the front of the House, on the left hand side was the Servants Hall where we had our meals and the next room was the Flower Room which held two big sinks and was where the ladies of the house arranged the flowers. There was a big baize door which led back to the front of the house and that was a small Hall. At the left hand side, beautiful curved stairs led up. At the back of the Study was a Gun Room and Gentleman’s Toilet which led into yard where the Game Larder etc was. Upstairs was carved iron rails with wooden banisters. At the top was quite a big square. To the left was a big room which was over the Study on the corner with the bay window. There were two single rooms which faced the drive and front steps and then there were the ones over the Drawing Room which was a very big room with Dressing Room off it which faced the garden. The next room was a Visitors’ double room and a single room and then the Colonel’s Dressing Room with their Bedroom off. On the landing at the top of the stairs was a baize door with a Toilet a long walk away. You stepped down some three steps going towards the back of the house and the Nursery. On the right was a room to store luggage Then very windy stairs up to the School Room and Governess Bedroom. At the bottom of those stairs was the Family’s Bathroom and Toilet and next to that coming this way was the Children’s Bathroom. There was a passageway out onto the other part of the House but going straight on was another two steps to go up and there was a little space and a huge airing cupboard. Straight in front of you was the Day Nursery and through that huge space was where the Governess and the youngest daughter slept. I lived in the Luggage Room and then later when the children went to school I moved into the Governess’s Room. A passageway between the Bathroom and Nursery was another baize door and through that was the top of the Vat steps. Our toilet was at the top and there was a sink and also a bath in the corner. The staff went on up the stairs again where there were three rooms and a box room. The Cook’s Room was the end one. The Butler and his wife Annie who was the Head Housemaid lived up the stairs in that flat as you came in the back door over the Engine Room. The Stables were away from the back door and cobbled flooring. There were four stables on the left and a Tack Room. During the War when the House was requisitioned for the Army I went back to the Uddens House and helped pack away everything contained in it, for removal. It was sad to see a once grand House so bare. Uddens House just prior to demolition? in 1955. I have lived locally all my life. My parents George and Nellie Smith were married at the Abbey in 1918. My father was the Farm Manager for the Abbey as he was unfit for the army. My mother was the Cook/Housekeeper at Uddens House at the time. I was born in 1920 and baptised at the Abbey. Mrs Elizabeth Oldfield of Uddens House was my godmother. Later in 1941 I myself was married at the Abbey and subsequently my three children were also baptised there. My stepsister was also married there and her firstborn son John who died aged two was buried in the little graveyard at the entrance. His grave was marked by a statue of an angel. 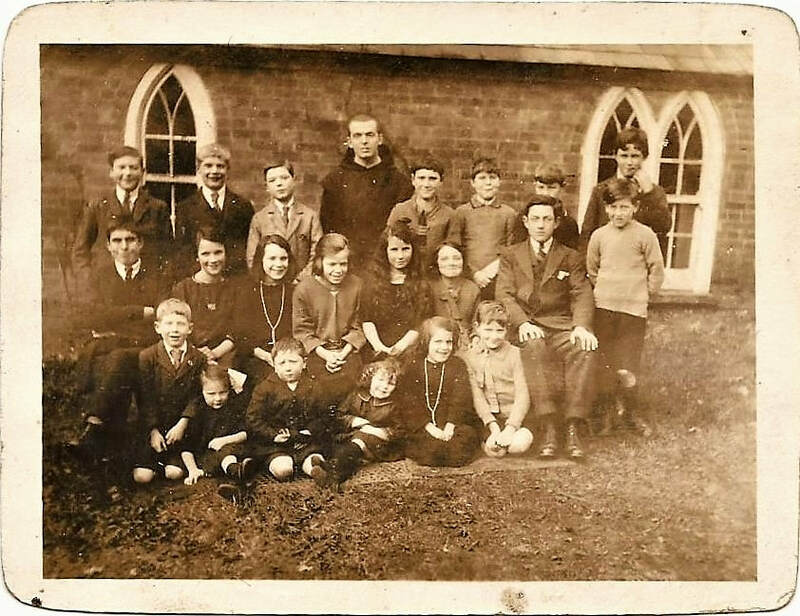 As a very young child my father took me on Saturday mornings to the school which was held there each week, where the nuns taught religion to the children of the village. The Lady Abbess came in on Saints days and scattered sugared almonds on the floor and we had to scramble for them. We were served rice pudding which we ate with tin spoons many of which were like little shovels where previous children had bitten them off. The nuns would put on plays and I distinctly remember one about a butcher. One of the boys, Jack Smith, skipped with the string of sausages and a white flannelled arm came out from behind the curtains and dragged him off and returned him moments later with very red ears! Father Tobin took us annually to Sandbanks in a Morris Cowley with a canvas roof and a can of petrol on the step used to climb in. It was a wonderful treat for us as previously we had used a horse and cart and had sat upon wooden planks. This meant that we had much more time to play on the sand and in the tufts of grass. Sister Louise was at the guest house attached to the convent and tramps regularly called in to see her for food and shelter. They were never turned away. On Sunday’s when we went for Holy Communion we went to the guest house and had a wonderful breakfast afterwards. There were always bells being rung to mark the day for the nuns. This called them to rise in the mornings, to pray and the Angelus at noon when the men in the fields had their lunch. The working nuns wore a brown habit as they had been unable to pay a dowry required to go into the Abbey. They were the ones who did all the outside work on the farm and gardens. They wore bonnets made of raffia, similar to the old beehives, when working outside. The nuns in black habits were choir nuns and remained within the Abbey. They were of a silent order and only spoke during prayers. When they ate their meals a choir nun would read the bible to them. There were also nuns who came over from Ireland and from France periodically and they would be seen in pairs outside of the Abbey grounds. Only once was I able to witness a nun entering as a bride of the church. The ceremony was first held in our part of the church and then she walked, dressed in her full white bridal outfit and entered through a panel into the enclosed order where she would have had her hair cut off, been stripped of her worldly clothes and all possessions and dressed in her habit. Rarely a nun would receive a family visitor and they would only be permitted to speak to them through a grill similar to that used at the Confessional. They had no physical contact with their relative. When a resident nun died her body was strapped to her bed board, dressed in her full habit and with her veil over her face. Her body would be buried in their own cemetery within the gardens. Obviously we did not have access to this area. For a period of time after her death her food would be given to a poor person in the parish. On Saints Days I recall processions around the Abbey grounds near the church. As girls we walked backwards carrying baskets of petals which we kissed and scattered before four altar boys carrying a pole each which supported a domed canopy, under which a statue of Our Lady Mary was carried. They were followed by the congregation singing hymns. After the War a monk managed the farm side of things. He was dressed in a brown habit. His name was Brother Berthman and I think he was German. The attached photo shows him standing at the back along with a group of us children. I am the little girl half sitting on the ground in the centre of the photograph. Father Tobin is sitting on the right.